On 11 September 2013, the Australian National Maritime Museum hosted a series of talks in honour of History Week’s Picture This theme. Organised by myself and my colleagues Penny Hyde and Annalice Creighton, our aim was not just to foster cross-institutional collaboration. It was also to explore a topic that’s been gaining momentum and has, in many ways, transformed the way historians and researchers work. We wanted to delve into the exciting, vibrant world of online cultural collections, and in particular photographs. 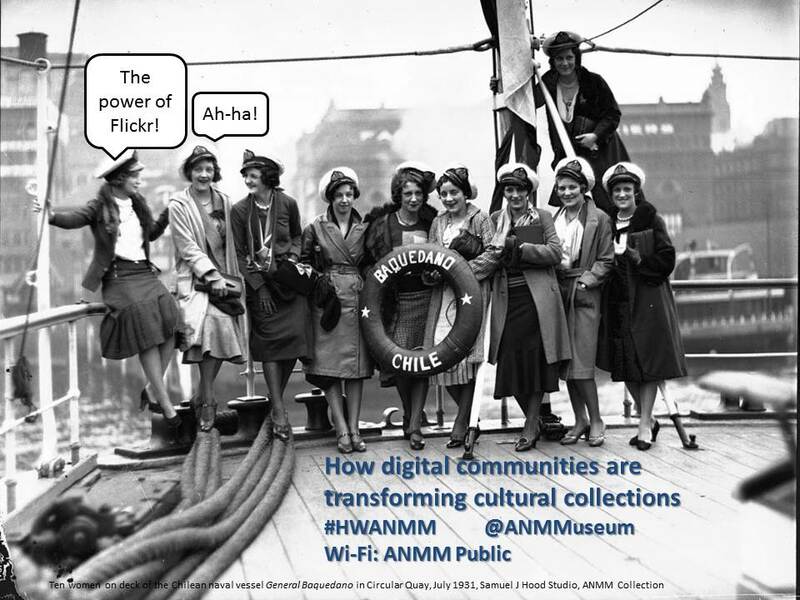 First up, Penny and I spoke about how digital communities, specifically the photosharing website Flickr Commons, have led us both through a winding path of historical discoveries. A handful of dedicated users come back to our photostream every day to see our new uploads and to answer queries or comment on our collection. Sifting through their research and turning them into stories for our blog, quarterly magazine Signals and other publications, has become the most rewarding aspect of our jobs. We call these researchers ‘super sleuths’, they call us ‘super digital outreachers’. The value these super sleuths add to each historical record shows that cultural institutions must not ignore online communities or just use their skills; rather they need to invest in them by facilitating a continual, two-way connection that ensures their efforts aren’t in vain. Our super sleuths show that stories can be multi-layered and never-ending as they continue to evolve and take on a life of their own. Paula Bray, Manager of the Visual and Digitisation Services department at the Powerhouse Museum, spoke about the strategy behind developing online collections. Paula is passionate about making collections available, responsive, shareable and meaningful for the audience. She noted that the focus isn’t really on technology but on content and engagement with the audience. Technology is a tool to help achieve this. She gave examples of the various ways their audience has used the museum’s content and collection to create Google street view “then and now” mashups, augmented reality apps, remixed photographs and so on. The core of Paula’s message was a call for each institution to embrace the idea of audiences as contributors to their collection and as citizen curators/historians. Bernard de Broglio took the floor to talk about his work as Internet Coordinator at Mosman Library. Bernard demonstrated how they were able to achieve amazing things with the library’s collection and with people’s own personal collections, despite limited resources. He stressed the importance of making collections available on the web so as to cast as wide an audience net as possible and, more importantly, to uncover the many stories lurking in the photographic record. He finished with a personal project, pointing out that “then and now” mashups can be one of the most powerful ways to illustrate the significance of historic photographs. Mitchell Whitelaw, University of Canberra, offered a different perspective, focussing less on content and strategy, and more on data as ‘rich traces of the world’. Metadata is what enables all this material to be found online. He raised the issue of the sheer size of cultural collections and how users are often faced with the daunting prospect of having to sift through reams of information online. This is where data visualisation can be a useful tool for arranging items in a way that’s digestible and useful – all through the use of metadata. Collections need to be presented in ‘rich, dynamic interfaces’, so that it’s a ‘pleasure and delight’ for users to trawl through them. Geoff Hinchcliffe, Director of Digital Library Services and CIO at the State Library of New South Wales, gave a talk about the library’s extensive Digital Excellence Program. Here they have been developing their online presence through various social media platforms including Twitter, Facebook, Flickr, Trove, historypin and Pinterest. Geoff also recognised the value of crowdsourcing and the notion of citizen curators, with particular reference to one dedicated Trove user who has corrected 2.1million pages in total! The last speaker, fellow PHA member Dr Lisa Murray, gave a great talk about one of Sydney’s most significant historical projects – the Dictionary of Sydney. As a born-digital history project, its aim was to present a ‘new angle on Sydney’s history’ with innovation, collaboration, connectivity and community at its core. It is a ‘multimedia city biography’ and a multi-layered resource for its users. One of the main reasons why the Dictionary has been able to continually expand is because of growing number of collections being digitised and published online. In this sense, as it doesn’t belong to any one particular institution, the Dictionary is like a focal point for Sydney’s history, a repository for a range of sources. What the Dictionary demonstrates is that a historic photograph is multidimensional and can illustrate many stories simultaneously – which sums up what this series of talks was essentially about. By empowering our audience to use and contribute to cultural collections, we are allowing a much richer, more complex and exciting understanding of the topic we all love – history.